Mapum, May 18 2014 : With the work progress far from satisfaction, a significant road which is being constructed under PMGSY to connect 18 border villages in the extreme Eastern region of Ukhrul district from Shirui foothill to Chingsui village has stirred discontentment among the public in the areas. In a recent visit to the ongoing PMGSY road construction site from Shirui foothill to Mapum village, the actual work of 15-km road that started in 2010 was found far from satisfaction and not in compliance with the standard guidelines. A spot inspection revealed that the road width is measured at an average of 10-12 feet while it has no drainage beyond few kilometres from the starting point. A reliable report stated the PMGSY road project under 8th phase from Shirui to Chingsui via Mapum will phase out in March 2015.With the work progress relatively at slow pace, the Sambu Raiping villagers are concerned that it may not be completed with satisfactory result. Mapum village chief AS Wungreingai appealed to the concerned authorities and state government to look into the matter earnestly. The road which connects the 18 border villages are Mapum, Chingsui, Ronshak, Sahumphung, Roni Matiyang, Chamu, Hangkau Kaphung, Khayang, Phungtha, Kachouphung, Kachouphung Tangkhul kuki, Langcha, Maokot, Chatric Khunou and Khullen, Chahong Khunou and Molnoi. "The road has shortened the distance of the border villages to Ukhrul district headquarters and would serve as a vital connectivity point for ushering in development in the backward areas," he added. 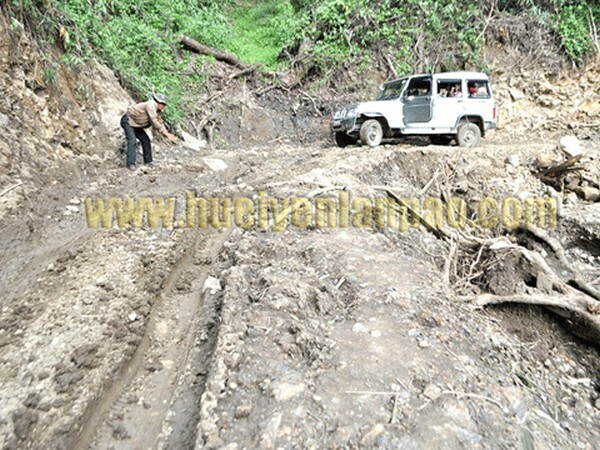 Earlier, the Mapum and its neighbouring villagers have to travel over 85-km to reach Ukhrul town via Gamnoum. Now, the new Centrally-funded road would take them about 35-km only to travel to district headquarters. Urging the state government to intervene immediately, Hormi Zimik, a social worker in the area, said that the matter would be taken to higher authorities if the work agencies do not complete the work by abiding to the standard guidelines. The people of the areas have also vented their displeasure against the work agencies, saying the villages were never consulted ever since the project started. "The road is for the villages in border areas�but we have not been consulted for the work. The work agencies are undertaking project in their own way," VA secretary Aphung Shimray complained. He further stated that when the villagers made an independent inspection, they found out that the road work is totally against the guidelines given under PMGSY. The 15-km long road is being planned to link another border road which is being constructed from Chahong Khunou village. In this regard, Sambu Raiping Long and Zingsho Longphang held a meeting with Tangkhul Naga Long (TNL) on May 14 and another consultation with TNL and Tangkhul Naga Wungnao Long on May 15 . In 2013, an official from the concerned department came for inspection and informed the villagers that it would be a new cutting road work. But the present road work is on an old route and with a faulty alignment," pointed out AS Rawung of Mapum village authority.